Join the discussion on our forums! Come discuss Guardian of Souls over in our dedicated Guardian of Souls discussion topic. Battlecry: Add 3 random cards you discarded this game to your hand. GG Played DK Guldan 5 times in a row. Loving the new discard buff. Let's see if either of these work. TFW you discard the card that lets you do great things with cards you've discarded. What if I only discard 1 card before play it? I get 3 copies or only 1? Op sideboob returns your Gul'dan twice. More news at 7. Huh. This is exactly what control discolock needed. Who'd have guessed? add Bloodreaver Gul'dan and 2 random cards you discarded this game to your hand. And that's what I call an EPIC! It could be even playable in control warlock with Soulfires. You can just get back what you lost. I look at you Alexstrasza! People need to understand one thing: if discardlock is sometimes viable, the quest still isn't. The quest is still too slow, far too slow. While i can see discardlock might be viable in the future (wild only, and i still doubt it, since you can also discard the soulwarden and discard is too random in general), i can't see the quest to be ever viable. First you need to play the quest on turn 1. Discardlock want's rather a 3/2 on turn 1 than a quest that does nothing. But let's say the quest was played. You need to discard 6 cards still. The issue is NOT if you manage to discard these. The issue is still: you need to discard 1/5th of your deck. On turn 6 you have drawn around 9-11 cards (if you are second, you get an extra card and the coin). So you still need to discard with 5 cards 6 of yours, because then you are out of steam. Ok, even if you draw 2 cards through 1 time hero-power and 1 time cobolt, you still only have 7 cards, and not every card can be a discard-card. Even if you manage all of this: you need still to play the card itself, and when you are at turn 8-9, only if you are lucky to get it till then: you can only use the portal + max 5 mana stuff. That's normally not enough to pull through. You only get the imps at the end of the turn, so you can't interact with them at all before the next turn. So in the end: might discardlock be now viable in wild: maybe. Is the quest viable too: probably no; not really. There is no rule that a Quest needs to be played on turn 1. You can play Flame Imp turn 1, and just play the quest sometime before you discard your first card. In any normal deck, discarding 1/5th of your deck would definitely be bad thing, but in discolock, discarding is a resource, similar to how Overload is a resource for an Overload deck. I am not as pessimistic as you about discard decks. 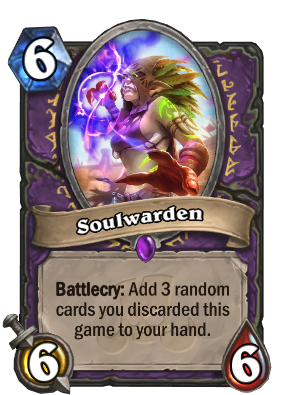 Between Soulwarden, Reckless Diretroll, and High Priestess Jeklik, I'm glad they're making a bid for Discard Warlock to maybe be OK in it's last possible rotation in standard. At very least, it'll be good for the memes. Getting a Soulwarden from another Soulwarden should be interesting.